Each day at Google CS First Friends, you used computer science to solve difficult problems. And to celebrate and appreciate your friend. Today's project gave you the chance to remember a few things that you have learned and accomplished in just eight sessions. This club may be over after today but that doesn't mean your computer science journey has to end. 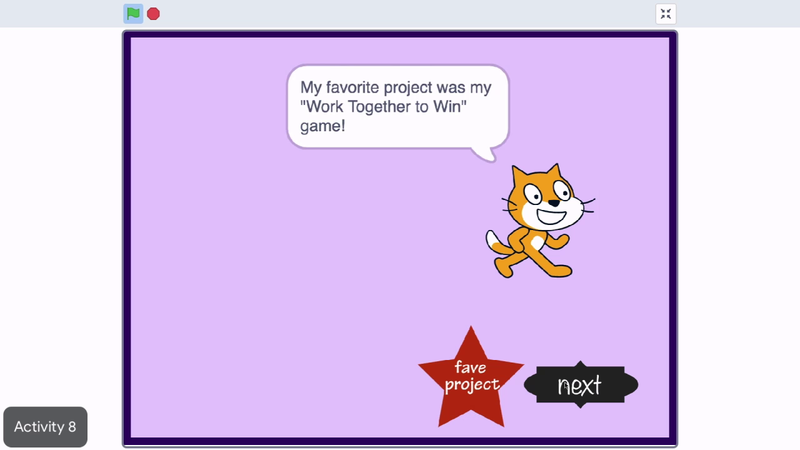 You can continue to access your Scratch account And your Scratch projects, outside of club. Like from your home or library Cool! The videos and activities you worked on are still available on the CS First website. Feel free to explore any of the other available themes. Scratch also has a large community of other computer scientist, who like you, are learning and creating with Scratch. Consider using Scratch to create an interactive story, Presentation Or game the next time you're asked to create a school project. As a Google CS First Club member, you should feel prepared for whatever your next computer science experience may be. The CS First Team would like to thank you and congratulate you on all that you've accomplished in this club. The future will be a better place with more computer scientists. And more people like you collaborating to create technology. We hope you enjoyed Google CS First.